As per our telcon just now, pls find attached the pixs of our 4 family members. 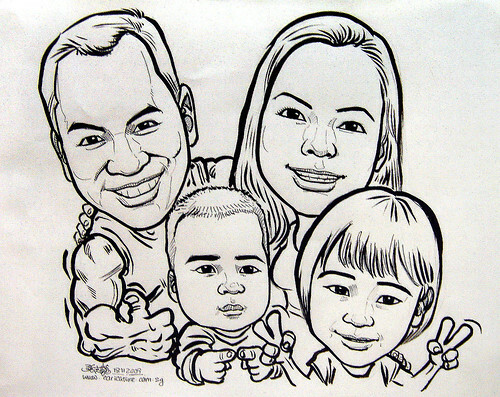 It’s a birthday present for the dad, so the idea is to have the caricature in pencil/pen (and my kids can colour on the clothes) & the picture will be something like the daddy & mummy hugging the 2 kids in front. (in landscape instead of protrait). Pls leave some space for us to write some words on it." My Nikon D80 is spoilt. Got to send for repair. Thank goodness I bought an extended 5-year-warranty from them when I purchased the camera. The above shot was taken with my 7 year old Sony F717. Not as good, but good enough for a decent shot.